If you love my flash calculator card, you are going to love this little iPhone app. 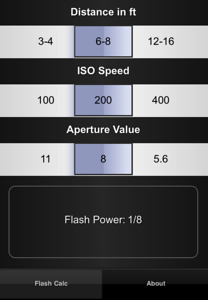 Select your distance, ISO and FStop and Flash Hero calculates your flash power when using a small portable strobe. Flash Hero works with most popular professional flashes like Canon 580, 430, Nikon SB 600, 800, 900 and of course my very affordable Strobie 130. Each flash is a bit different that is why Flash Hero selects a distance range, i.e. 3-4ft. More powerful flashes (usually costing over $400) will work at the farther distance and the lower cost flashes work at the shorter distances. My Strobie 130 works at the shorter distance range. It is also important that your flash head is set at 35mm which is the default setting on most flashes. When using flash in manual mode, your shutter must be below the X-Sync which is 1/250 or slower for most DSLRs. To shoot at low Fstops in bright sunlight, try using a ND filter. Practice with your flash to figure out your precise distance and you’ll never have to use a light meter when using flash because Flash Hero helps the photographer predict flash values on a consistent basis. In your iPhone or iPad search “Scott Robert Lim Flash Hero” in the App store. Derek Cadzow - Just got it… can’t wait to use it! Jim - Having issues trying to download the Scott Robert Lim Flash Hero app up here in Canada. Any insights? admin - hmmm, I will look into it. So sorry, what type of phone are you using? Anonymous - It would be an Iphone. jim porter - any plans on making this available for android? Sarah - Are you.going to make it available on android? admin - yes, hopefully soon! Maria - how do you download or receive the card with the flash calculator? admin - if you search the Apple App Store you will find more info on it. look for Scott Robert Lim Flash Hero.